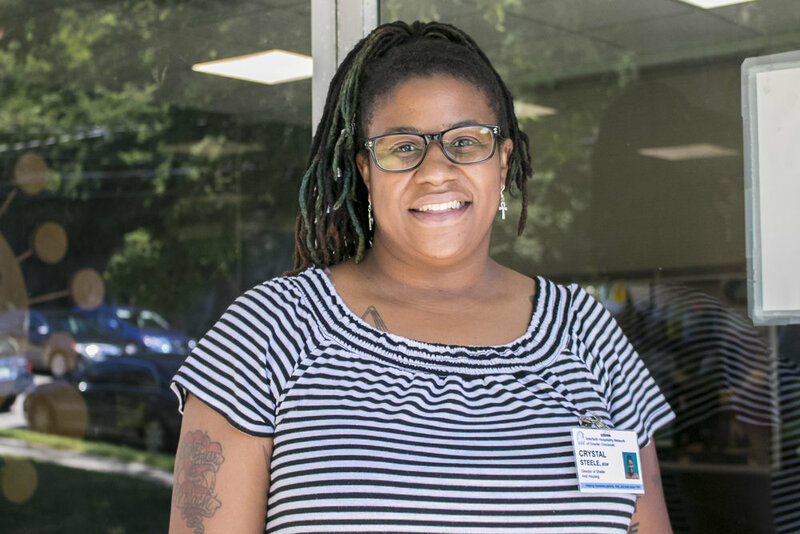 For five years, Crystal Steele has worked at Interfaith Hospitality Network (IHN) of Greater Cincinnati, helping families facing homelessness get themselves back in safe, secure housing. She knows what the families are going through and how to help them. She knows, because she was homeless once, too. Would you mind telling the story of when you were homeless and how that came about? I don’t mind sharing my story at all. It shows triumph – how you can get through certain situations. Well, I’m a single mother of three boys. This happened in 2010, so they were a little younger then. I paid my rent to my landlord, on time, every month. I was working three jobs at the time. I paid my rent for that month on the first. And on the second when I came home from work, my things were out on the porch. Come to find out, the landlord sold the building, didn’t let us know, and I couldn’t get my rent back for that month. What neighborhood was this in? My oldest was 10 at the time. Then I had a 6-year-old and a 3-year-old. It was all about time management. I still had time for my boys, of course. I would mainly work a first-shift job – work full-time on first-shift – and then second shift, I would work two part-time jobs. So I may work Monday, Wednesday, Friday for one part-time job and then Saturday and Sunday for another part-time job. Then I was going to school online, so I would do my schooling when they went to sleep. I look back on it now and say, “How did I make it work?” But I made it work. How much of your income was your rent taking up at the time? My rent was a lot. I mean, on top of gas and electric, and then of course having the regular responsibilities of a car note, car insurance, daycare fees… I was paying out-of-pocket tuition at that time, too. But rent was the majority of it. I would say it was 65 percent of my income. I went to a shelter in Dayton. Stayed there for about a week. The case manager there did not even acknowledge me. Did not even say hi, or “I’ll be right with you” – nothing like that. So me and my boys ended up leaving. I slept in the car for two nights, and then eventually I went to stay with my mom, who was in a one-bedroom apartment at that time. I just got my king-sized mattress and we just crashed in her living room until I was able to save money to move into another unit, which took about eight months. Did your kids have to move schools then, too? No, I transported them back and forth to the schools they were going to. Is your story similar to the stories you see here at IHN? Majority of the stories are kind of like mine. It could be landlords not taking care of the property. It could be vermin or roach infestation in an apartment where people don’t want to stay longer than they have to in a unit. Of course, there’s non-payment of rent. If clients can’t pay their rent on time, the landlords aren’t willing to work with them. There’s issues with neighbors. It’s not stories exactly like mine. But they’re all relatively the same, wrapped up kind of in one. Were you already in school then to be a case manager? Actually, no. That’s a whole ’nother story. I actually went to school for middle school education, math. I have my degree in middle school education. So why did you decide to switch to social work? I think it was because, as a case manager, you can do more for people. You’ve walked in their shoes before. Like, me being a single mother, I’ve been through the JFS [Job and Family Services] system; as far as getting food assistance OWF [Ohio Works First] for a couple months. Been on Section 8. I just seen fit that me being a case manager, people know where I came from, and me already living through that struggle of being a single parent, I think a lot of people will relate to me. So that’s when I kind of decided to say, “You know what, I’ll just not do teaching. I’ll keep that maybe on the back burner, but go into social work.” I’ve always been a people person; always been outgoing; always been a helper. So, I believed that social work was the best fit for me, and I have found out that it is. I love my job. I love the people that come through here, through our shelter; love the people and colleagues I work with in the system. So your job as a case manager, what did that look like on a day-to-day basis? What do your case managers do now? Well, meeting the clients. Seeing where they are, first of all, and not being judgmental when they walk through the door. Not saying, “Oh, you’re homeless; you’re going to always be homeless.” We don’t put that judgment on them. We’re here to help. Them coming in the door, it’s like, “Hey! What’s your situation? How can we help? This is your case plan. What do you want to do? What barriers do you see that are hindering you from getting a new place?” I would meet the clients every day, to see what they’d done the previous day; see how I could help them more to rid their barriers. Even if it’s, “Oh, I still have Duke Energy on in my previous place. How can I get that disconnected?” It’s also life skills. A lot of them don’t know life skills. You have to step aside from being a case manager and also kind of be a mentor, as well. It’s a lot that a case manager in the homeless system does. We’re not just a case manager to get you in and get you out. We want to see what the actual issue was coming in the door. So, when you were working with families, you talked about barriers. What were the barriers they were facing? And what barriers did you face trying to get them help? Good question. Some of the barriers that we see is, like I mentioned before, high Duke Energy bills. That’s the biggest barrier we see. We try to work with Duke to rid that barrier, but again, that’s a hard thing to do with a [huge] bill. In that case, we do try to encourage people to file bankruptcy. But again, that’s a money factor. You need about $1,000 to file bankruptcy. And we try to negotiate with Duke, like, what would that person need to get back on PIPP, where the Duke bill is converted to going by their income and not just a regular average of usage? That’s one barrier. 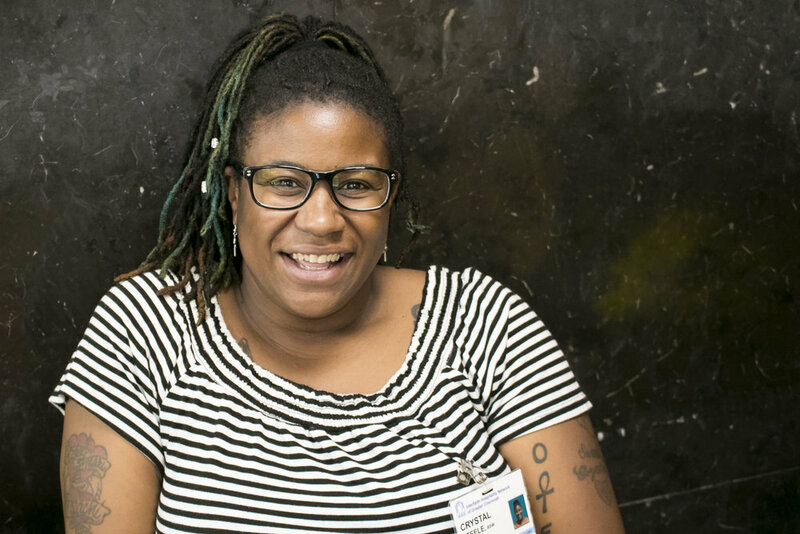 It was, “Let me go to the Cincinnati library and sit there with three kids and look up how I can do all these things,” and on top of that, work three jobs and still do school. Another barrier I see is unemployment or not enough employment. The average minimum wage here is what? $8.50, something like that. [Editor’s note: Ohio’s minimum wage is $8.30 per hour.] The rental rates have went up in the last two-and-a-half years here in Cincinnati, but wage is still the same. So again, if somebody works a 40-hour job and they’re making $8.50 an hour and their rent is $625, you know, they would have to work full-time plus overtime – if the job offers overtime – to sustain their unit. Because we’re talking about transportation, you know, paying rent, paying Duke, paying daycare, all those factors that will hurt people in the long run. With the employment thing, we try to have the families enroll in GED or life skill programs to increase their skills. We work with Cincinnati Works to have them come up to our shelter and talk to the families about getting more skills under their belts and not just having a high school diploma or GED. Customer service skills – we work with Urban League on that. People that have mental health issues, we get with BVR, the Bureau of Vocational Rehabilitation, for that. That’s how we deal with the employment side. Those barriers are more complex. We have to see what’s really causing you not to work. That kind of takes a longer period. But we’ve had people come into the shelter not having a job and leave having a good, $10-an-hour job. Another barrier is transportation. A lot of families can’t transport their kids to daycare or don’t have daycare for the children coming in the door. So, they let us know that issue: “I want to work, but I have nobody to watch the children.” As far as JFS goes, they have to have some kind of employment or be doing some kind of school before they can get daycare, so then that’s another barrier. But luckily, coming into the shelter system, we have a connection with JFS where they will provide childcare vouchers to our homeless families with or without employment, and without having to go to school. That lasts 60 days. So in those 60 days, we try to help them. Another barrier that hits all the homeless families is evictions. Evictions is a major problem anywhere, but it’s a major problem here. Landlords do not want to deal with families or people who have recent evictions. Landlords look for people who don’t have evictions in the last three to five years. If you’re a family who got evicted from your last place, you have an eviction on your record, so then landlords don’t want to work with you; you’re deemed as a bad person who doesn’t pay their rent. But it could have been a whole, totally different reason why you were evicted. I have an eviction record from 2010, when they threw my stuff on the street, and I paid my rent. Back then, I didn’t know how to fight for that. I didn’t know about Housing Opportunities Made Equal. I didn’t know about Legal Aid. If I did then, I would have took the necessary steps to either get my money back or them putting me in a new place right then and there. But I didn’t know that. Well, how would people learn that without going through it? Right. That’s the thing. Unless you actually go through it, that’s when you say, “What resources do I have now?” Now, you have in the palm of your hand [holding her phone] your encyclopedia, as I call it. You can go to Google and say, “What do I do if this happens?” But back in 2010, that wasn’t a thing. 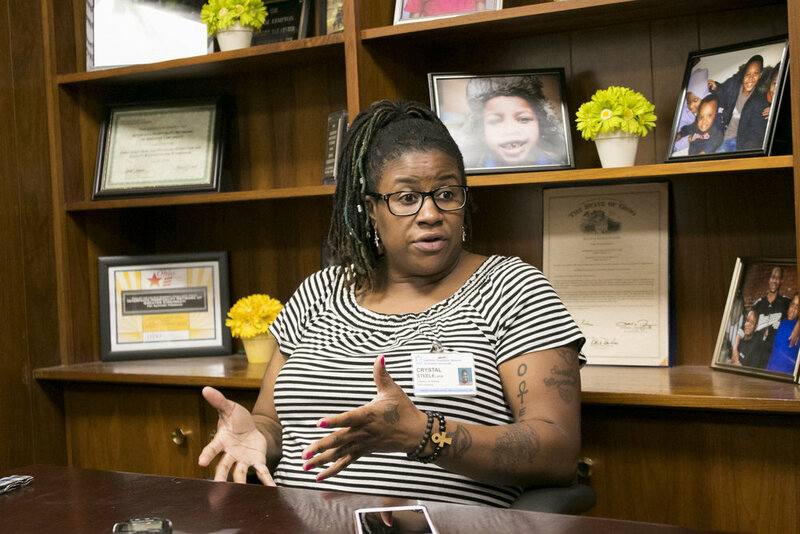 It was, “Let me go to the Cincinnati library and sit there with three kids and look up how I can do all these things,” and on top of that, work three jobs and still do school. I didn’t have that time or effort to put into that. But yeah, those are the top barriers that we see. And convictions, you know, having a record is another one that again, landlords don’t look past; don’t want to deal with that. So, how did you get past your eviction record? It’s still on there. I ended up getting on – I can’t remember what the website is called, but where it shows all the foreclosed buildings and things. That’s how I finally told my next landlord, “Okay, the place I was living was foreclosed on, and here is proof that it was foreclosed.” Again, he was sympathetic with me and he ended up letting me rent from him. I stayed for five years at that place. Then I’d a probably still been with my mom. What about the families you work with now? Are there other ways for them to get past eviction records? We usually coach families when they come in the door to see if they can get a letter from their previous landlords stating why they left. If it’s non-payment of rent, get something from the landlord saying you were unable to pay your rent. You want somebody to be truthful to the next landlord, to say, “Oh you got this eviction. You’re deemed a person who doesn’t pay their rent.” If you get a letter from the previous landlord to explain, “This tenant was in my unit for six months; paid their rent on time, but then came on hard times and couldn’t pay the rent,” things of that nature, then we can kind of coax the next landlord. You know, this person went through hard times; they’re working; we’ll help them pay their rent; the housing programs that we have available, we can be their safety net from here on out. How long do people typically stay at the shelter? Our length of stay is usually 30 days. That would give us 30 days to work really hard to try to get people employment if they don’t have it; childcare; try to negotiate with Duke; finding new landlords; finding childcare near the place they want to live; giving them resources near the place they’re living. It’s a really intense 30 days. But the most the people will stay – depending on barriers, depending on their past, as far as convictions, employment history, things like that – is usually 60 days. Some families are tougher than others. We just work with them. Slow and steady win the race sometimes. I noticed on your annual report that more than 90 percent of families that leave the shelter end up staying in stable housing. Within what timeframe is that statistic? It’s usually within a year. We go by recidivism. So if people leave and then come back to the shelter within two years, that’s recidivism. Can you put that into perspective compared to other shelters? How do you do keep families in housing? I have to give credit to our after-care program. If we didn’t have the after-care program, we wouldn’t be able to keep the people in housing. That after-care case manager will be like that safety net; if they need more resources, more life skill training, that case manager is there to say, “Hey, you’re not alone,” or “I’ll send you here,” or “Go here to get more budgeting,” because it might be that issue. And then you said there’s also money for rent assistance? Yeah, so through our after-care program, we do have funding. It’s based on a yearly contract. We get a certain amount of money every year. Other shelters also have after-care programs. Ours is, we try to go above and beyond, past the budget that we usually have. Sometimes we run out of money, but we point them in the direction they need to go to get that rental assistance. Is that state or federal money? Local? One of the after-care programs is City of Cincinnati, through the Human Services fund. Then Strategies to End Homelessness gives us money to help with after-care, as well. The other thing I noticed in your reports is that your families helped doubled from 2015 to 2016. Why did that leap happen? Well, for the past couple of years we’ve been doing what’s called a summer surge. This was recommended by Strategies to End Homelessness and a couple of other shelters here in Cincinnati. 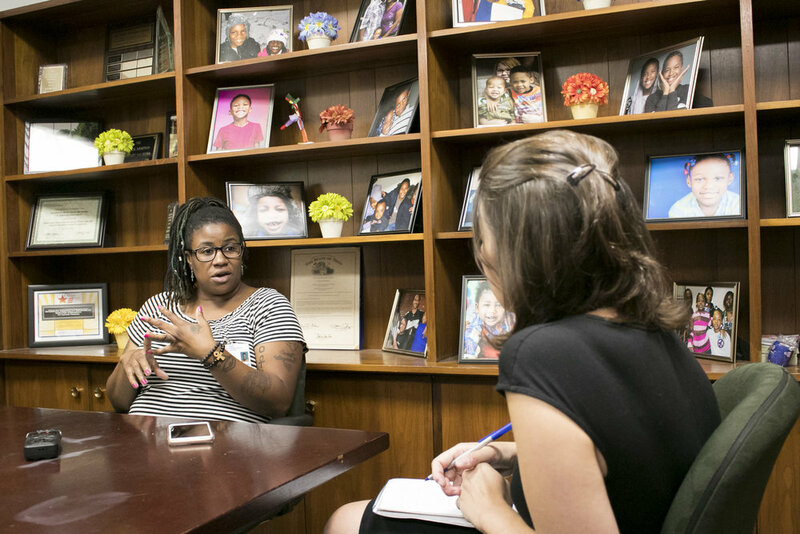 We see a spike in homelessness for families in the summertime; the reason being is because kids are out of school; there’s nice weather; families that they’re doubled up with are more amped to push them out. So, we seen this spike in the summer, so Interfaith and Bethany House, we do the summer surge. We take extra families in the summertime. That’s where the increase is. We serve four additional families here at Interfaith over the summer. Normally we only serve eight. But during the summer, between June and September, we take four additional families. And you know, that’s rotating: getting them in, getting new people; it’s a revolving door. What would those families have done without you all taking the summer surge? Anybody facing homelessness will call the CAP line. People still call now and our shelters are full. They would just have to stay doubled up with families and friends until a space comes open in the shelter system. They would just keep calling the CAP line. No telling when they’d get in if we didn’t have the summer surge. How often are your shelters full? Oh, all the time. The only time we see that a lot of families are not consistently coming in is usually around income tax time. But when that money’s gone, that’s when the floodgates open. Do you all keep track of how long families have waited to get into your shelter? What can people do to help? What could the city or county or random person do? It all boils down to housing. If we had enough affordable housing here in Cincinnati, then a lot of the families would be able to afford their housing. And increasing [wages] would help tremendously. Do you see threats that could decrease the supply of affordable housing further? I’m all about small business. But it boils down to people wanting to start a small business, have a small business, and then that takes away from housing. Like, how OTR is building all the businesses downtown; you know, they’re kind of moving people out of their housing … but not helping them with relocation. If they are moving them out of their units, then help them with relocation. It plays a different role for the children, because it’s like, “Did I do something wrong? What did I do?" ... I sure enough had that conversation with my boys. Let’s talk about kids dealing with housing insecurity. How does all of this affect them? Luckily we have a child enrichment program here. Our child enrichment program coordinator kind of keeps the kids busy with activities. Summer camp just ended last week for the kids that are in school. A lot of parents and people in the community don’t know the effects it has on a kid. You know, one day you’re in your own room; you’re playing with your toys, and the next thing you know, we’ve got to pack up and move. So, where’s my toys? Where’s this? Where we going? It does affect a child. From my personal experience, my boys were affected because, you know, they would go to school, but they would act out in school because they didn’t have their own room to have their own privacy. We were in the living room seeing each other every day. We all have to compromise on what we wanna watch. So, yeah, it plays a different role for the children, because it’s like, “Did I do something wrong? What did I do?” It comes back down on the kids to feel like they have done something for Mom or Dad to lose their place. But I think it’s a conversation parents need to have with the kids. I sure enough had that conversation with my boys. I knew they understood after that. After that, they didn’t act out in school. They understood the situation. We still went to the movies. We still went to the park. It’s just that one little crutch in life that we had. And now they’re honor students and they know that if the lights are off, hey, Mom didn’t have the money to have the lights on. But it’ll be on. Let’s just have some candles; let’s just sit and tell stories or play games or whatever. That must be hard as a parent to explain a situation like that to your kids in the first place. It’s definitely hard. You feel like you failed as a parent. Man, I got my children in this situation. I’m supposed to be the protector of them. And nothing happening to them. And keeping a roof over their head and keeping food in their mouth. Yeah, it was hard for me to have that conversation. But I felt the need to have that conversation because I didn’t want to keep it from them. Some kids think, “Oh, was I too loud in the place. Is that why we had to move?” That’s what my one son said: “Were we too loud? Is that why they kicked us out?” And I’m like, ‘“No. It wasn’t that.” That’s when I felt like I had to have the conversation with them. Does that ever happen to families? To have a landlord not want to deal with kids? I think landlords do screen out how many kids are in a household. We do see a large family through, and it’s hard to house a large family. And, if we’re talking about affordability, if we’re talking about a family that has four kids, you know, they’ll need a three-bedroom. You’re talking about $800, $900, sometimes $1000. We know families can’t afford that. So, we try to say, “Oh you know, get a two-bedroom.” Landlords are like, “Nope. That’s too many kids in a family. What are you trying to get them down to when you talk about affordability? Thirty percent of their income? Usually, we don’t go by percentages. We’re not living the family’s life. We look at it like: What do you want to do? What is something that you can afford? We’re talking realistically. We’re not talking about, “Oh yeah, I make $1,400 a month, but I can afford $1,000 rent.” No. That’s not affordable. You spend the majority of your money on housing, but then you’ve got $400 for transportation, childcare; birthdays may be coming up; you wanna spend for a birthday. Back to school is coming up. Just, sit down. Let’s do a budget. Let’s get our guy in here to sit down with you. And boom. This is what you can afford per month. It could be $600, with you having that extra $800 a month. We ask them to write down all their expenses – cellphone bills, daycare – luckily, if they have a daycare voucher, nine times out of 10 you’re not paying daycare, which is an awesome thing – but then you have transportation and getting them to and fro, even if it’s bus or car; that’s gas. Gas is almost $3 a gallon. We make them see the real gist of life. The day in a life, in a month. We say, “Okay, you think you can afford $1,000 a month; let’s write that down.” Rent: $1,000. Okay, let’s talk about gas and electric. What’s the average cost? We’ll call Duke and ask, “What is the average cost for this unit?” They’ll give it to us; we write it on the budget. Then, we say, “Okay, the car note, how much is that? Gotta pay car insurance. You can’t be driving with no car insurance.” We do it line by line. It sounds intense, but that’s what we actually do. That’s when they see, no, I can’t do it, and they drop down a bit. We’ve had landlords that say, “You know what, I’ll take a family of five in a two-bedroom,” because they know if they go to a three-bedroom they wouldn’t be able to afford it. But then the landlord is right really telling them, I don’t want damages to the property. Things like that. We always ask if there’s been a woman who’s influential in your life. Who’s the woman who’s influenced you in your life and in this work? And I said, “Oh. Well, maybe that’s okay.” She ended up getting me that scholarship, and I actually went to school, NKU, and did my first couple of years there. She was the most influential person in my life. And then, my mom, Matilda Steele, who always wanted to be a social worker; never got to be a social worker, because she never went to college. When she found out I was going to be a social worker, she was excited.